Happy New Year of the Snake! Today is the first day of Chinese (or Lunar) New Year, and I'm wishing you all a prosperous, healthy and joyful year ahead! Time flies~ Here comes the thirteenth Shameless Spoil post since I introduced this series. Can't you tell I'm so utterly spoilt, thankful? 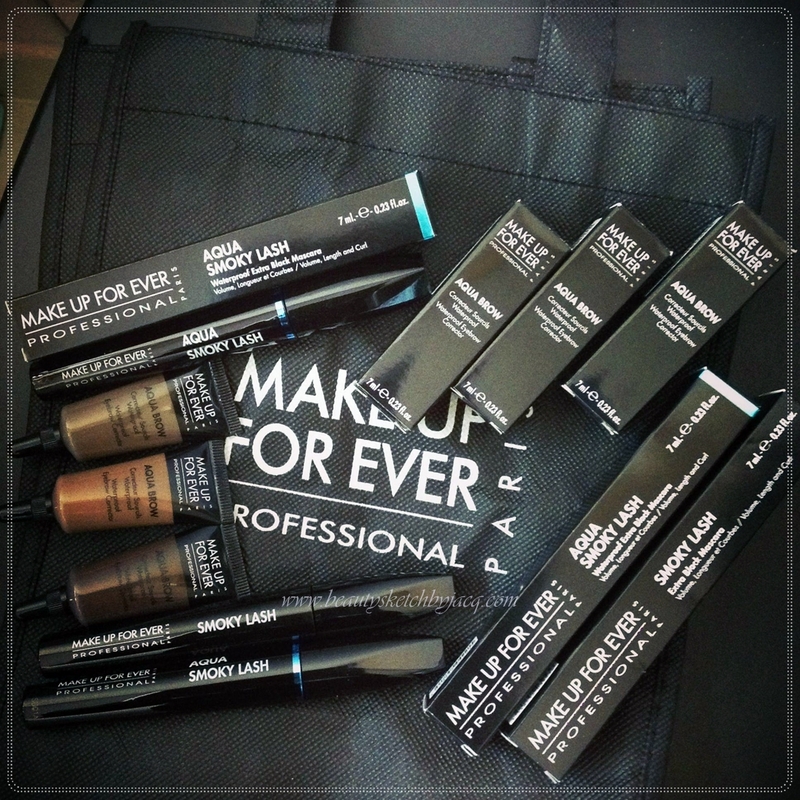 Anyway, in mid-December, perhaps 1 trip before the Body Shop gingerbread man hunt, I managed to ran into a pop-up booth of Make Up Forever with great discounts. Most colour items in store are doing buy 2 get 1, or 3 for 2. I kept my sanity and only go for two main items I have wanted for long. The Aqua Brow and Smoky Lash. Mr. Fiance, as always, gladly and automatically paid for these. You won't believe how bright his smile is when he can buy me something I like, I guess boys want us girls to be straight-forward with what we desire - at least, sometimes? Aqua Brow is a "long-lasting, smudge-proof eyebrow corrector that fills, defines, and lengthens brows. "; "a highly pigmented gel that enhances and reshapes natural brows. Its superior waterproof formula creates a strong hold while its high concentration of pigments allows for intense color payoff that will not fade. Aqua Brow’s creamy gel texture gives an even, natural result that will last all day." The saleslady (or mua) told me I can apply this either with a spooly brush or a slanted brush. So far I have only tried the slanted brush method and shade No.25 (FOTD wearing this, and another FOTD) works with my colouring very well. Considering the tiny amount one needs for each use, I think these will last forever. They are sold at US$20 only on the USA Sephora website, whereas they are HK$210 here. With the 3 for 2, each costs about US$18. I call this a steal! Have you tried MUFE Smoky Lash or Aqua Brow? Are you interested? What is your current favourite brow product and mascara? 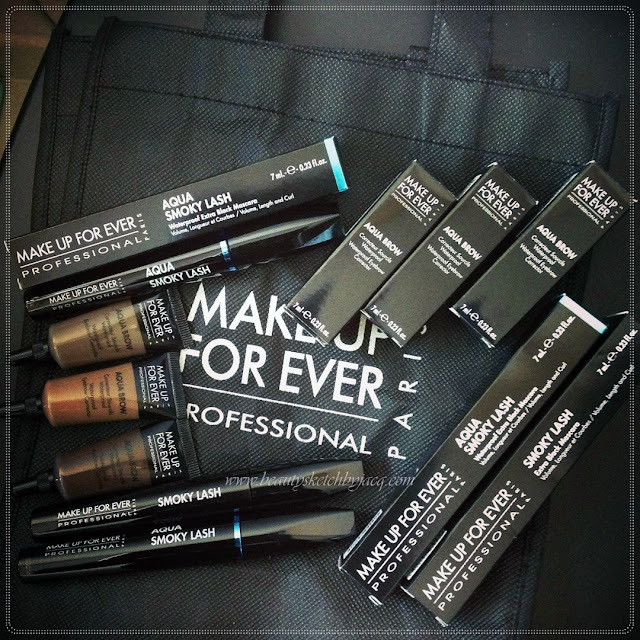 I haven't tried any Make Up Forever products because I didn't wanna take the plunge and spend that much money but they sound fabulous! I might have to just treat myself! OMG they had a pop-up outlet store?? Is it in Tung Chung??? LOL i'd love to try some MUFE stuff!! in the past i tried their full cover concealer but dunno why i swapped it away...then i got a mini version of their aqua liner and love it! it was! it was around December time... I checked this past CNY holiday and it was gone... i still have their full cover concealer and it is pretty amazing! aqua eye is great too! oh, and i think we shall go shopping sometime!!! !